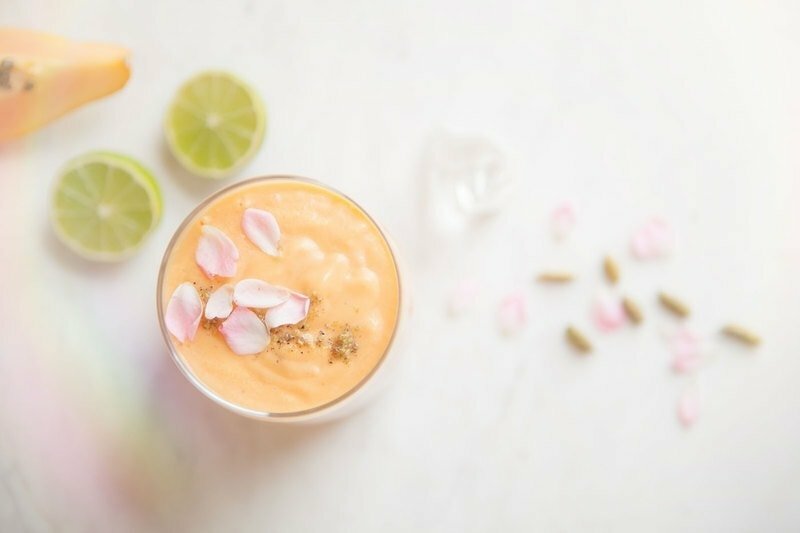 A dairy-free, coconut-based Papaya Lassi filled with ingredients to help soothe the digestive tract: aloe vera, cardamom, Manuka, lime and rose. Rich in probiotics and digestive enzymes. 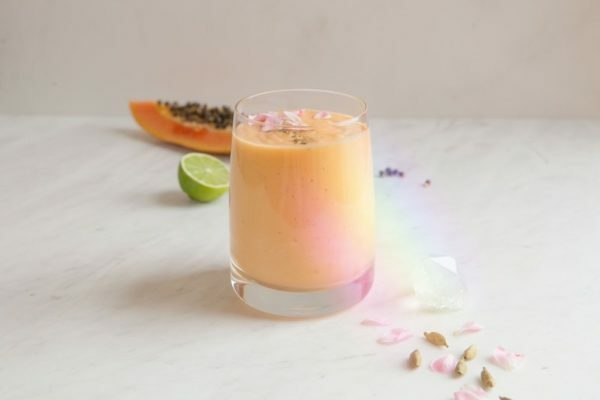 Summer time calls for a nice cool, creamy Papaya Lassi, don’t you think? A lassi is a traditional yoghurt-based drink from India, typically made with fresh mangoes. But for this recipe, I’ve replaced the yoghurt with thick and creamy coconut yoghurt (probiotic rich) to make it diary free, and used deliciously ripe papayas. I added in a few other interesting ingredients for this one, freshly ground cardamom (the smell!! ), fresh lime juice and a couple of teaspoons of Manuka honey for its lovely antimicrobial properties. I also have a little rose bush in the garden, and since it hasn’t been sprayed, I literally just plucked a few petals and threw them in. Genius idea. Lastly, I used just a dash of aloe vera juice. This isn’t something you can taste in the Papaya Lassi, but I like aloe for its soothing effect on the digestive system. I love this time of year, because after all the festive indulgences of December, you have that beautiful warm month of January to eat clean and light foods and restore balance to your body. The microbiome of your gut can take a bit of a beating with all that rich food, sugar and champagne! So I guess you could say my partner and I have been on a wee health kick since the new year. I’ve particularly been including more gut healing foods in my day. Lots of simply combined meals, ferments and organic vegies. Your gut is so important to your overall health, so in a way I see the month of January as a way of slowly building up your vitality and resilience from the inside out, to carry you through another big, long year. I made this drink for my breakfast today, the recipe will serve two smaller glasses or one really large one. I definitely couldn’t have finished it all on my own. The ingredients used (papaya, coconut yoghurt, Manuka honey, aloe and cardamom) all ease the digestive system in their own way. Papaya particularly so, here is a little on why it is so great for you. Firstly, I have to mention, that eating a truly ripened papaya vs one that’s not quite there, makes the world of difference. I left mine out on the kitchen table for over a week till it was soft and spotty, and oh my god, tropical heaven explosion in my mouth. General health benefits include a whopping amount of vitamin C (just over 88mg per cup of chopped pieces)  – the daily recommended intake is 45mg/d . This makes it fabulous for the old immune system. They’re also a great source of fibre for colon health and lowering cholesterol , folate and vitamin A (in the form of carotenoids) . Carotenoids are the yellow and orange pigments in the fruit and skin, and are converted in the body to vitamin A. Vitamin A is a fat-soluble vitamin, and likewise, carotenoids are better absorbed when eaten with a little fat . 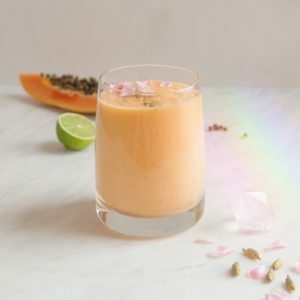 So, the pairing of the papaya with the natural fat in the coconut yoghurt for this Papaya Lassi recipe is a great one. Vitamin A is itself a potent antioxidant, important for eye health, normal growth and development, immune system function and in maintaining the health of epithelial cells in the body (such as the skin and mucous membranes). Papaya also contain proteolytic enzymes (enzymes that break down/digest proteins) such as papain and chymopapain [3, 4]. Papain is found in the bark, leaves and fruit of the plant  but is especially concentrated in the unripe fruit  – though in my opinion – better to eat the tasty ripe fruit and get some benefit than none at all, right? (Green Papaya Lassi? No thank you!). The enzymes’ ability to help break down and digest proteins makes papaya a good thing to munch on before a heavy protein meal. If an individual is lacking enzymes and is unable to efficiently break down the food in their gut, a nutritional deficiency may arise as a consequence . These enzymes are also sought after commercially, and are used in chewing gums for digestive distress, toothpaste (weird!) and meat tenderises . 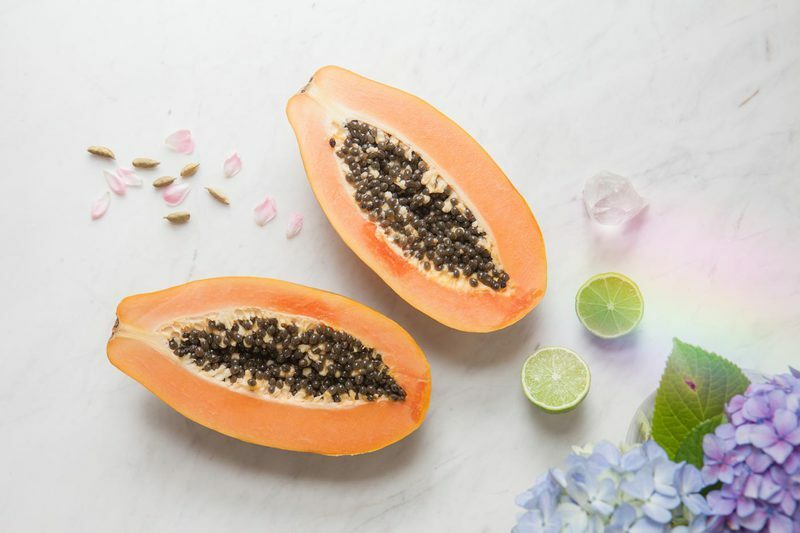 Finally, aside from protein digestion, papaya has been used to ease digestive disorders such as nausea, dyspepsia, indigestion , and constipation . Papaya is traditionally used for treating a range of skin disorders, such as wounds. For example, in Africa, the papaya fruit pulp is mashed and applied topically to burns . The papain enzyme has an ulcer protective effect while the plant as a whole has antimicrobial (bug-killing) and anti-inflammatory activities . Studies, in support of traditional use, have confirmed that papaya as a topical application has a strong wound healing effect – likely due to its proteolytic, anti-inflammatory enzymes [9, 10, 11]. When you put these incredible proteolytic enzymes in context of the whole fruit – and consider the vitamin C, E and the carotenoids, then it is no surprise that as a whole it has anti-inflammatory actions [3, 4]. Guys, eat papaya. Papaya are rich in lycopene. Other sources include watermelon, guava, tomatoes, apricots and pink grapefruits, so eat those too please. Lycopene is protective against prostate cancer . 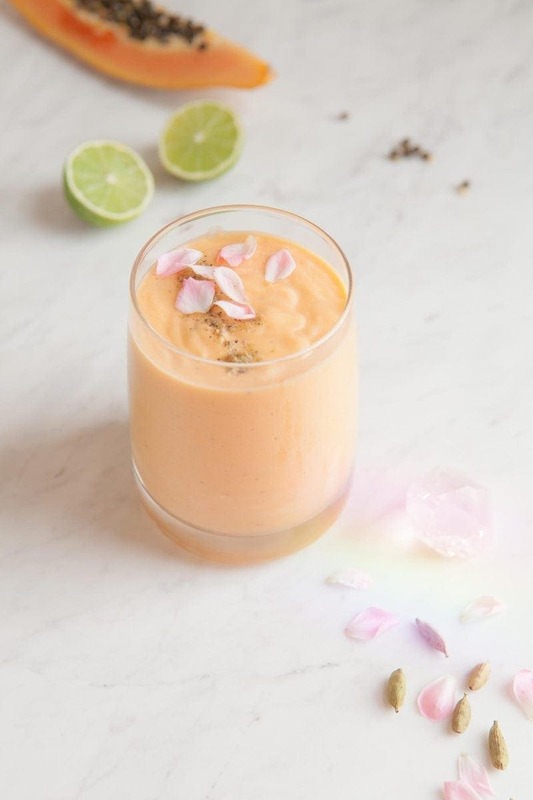 A dairy free, coconut based Papaya Lassie with cardamom, aloe, Manuka, lime and rose. Rich in antioxidants, probiotics and digestive enzymes. Sprinkle extra cardamom, rose petals and crushed pistachios if you have them, over the top to decorate. ARAVIND, G., BHOWNIK, D., DURAIVEL, S., & HARISH, G. (2013). TRADITIONAL AND MEDICINAL USES OF Carica papaya. Journal of Medicinal Plants Studies, 1(1), 7-15. NAYAK, B.S., PEREIRA, L.P., & MAHARAJ, D. (2007). WOUND HEALING ACTIVITY OF Carica papaya L. IN EXPERIMENTALLY INDUCED DIABETIC RATS. Indian Journal of Experimental Biology, 45, 739-743.